In this worksheet, students will gain a deeper understanding of feeding relationships between organisms. For many of us the answer may well be "the supermarket!" Actually, almost all of our food comes from plants and other animals. Animals such as sheep eat grass and other similar plants. When the sheep has grown to a suitable size, we kill the sheep and eat it. 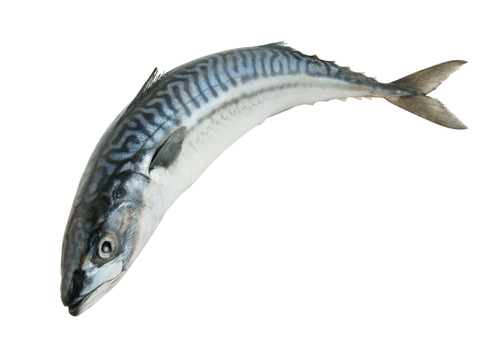 In the seas and oceans small fish such as mackerel are eaten by bigger fish such as trout. 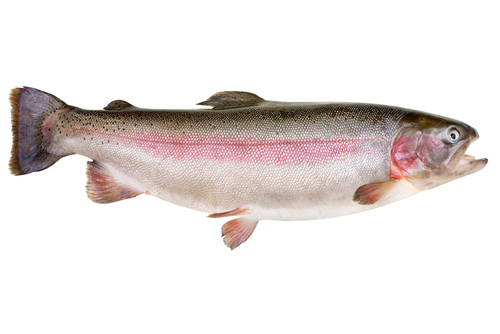 The trout might themselves be eaten by even bigger fish such as sharks, or they are caught by us for our food. Food chains are very useful diagrams which show us the feeding patterns of different animals. 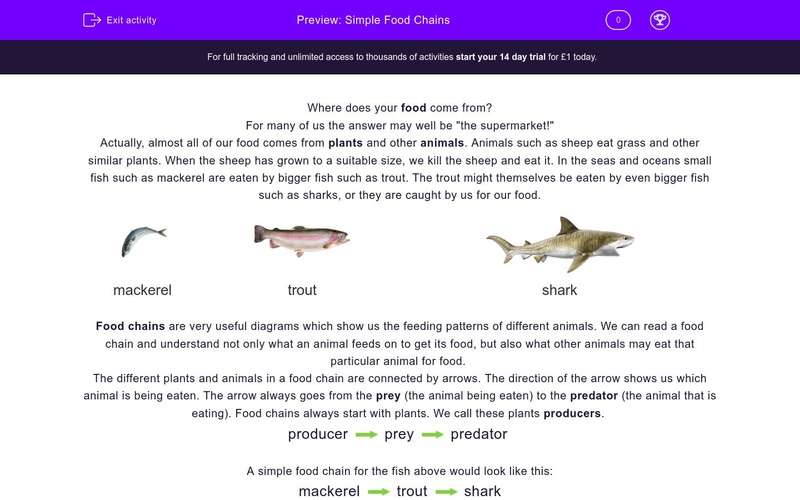 We can read a food chain and understand not only what an animal feeds on to get its food, but also what other animals may eat that particular animal for food. The different plants and animals in a food chain are connected by arrows. The direction of the arrow shows us which animal is being eaten. The arrow always goes from the prey (the animal being eaten) to the predator (the animal that is eating). Food chains always start with plants. We call these plants producers. 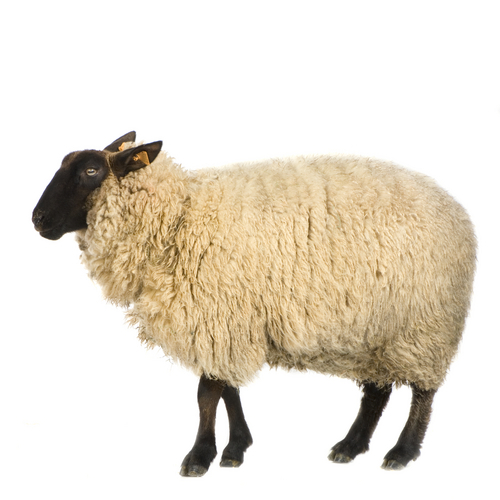 Humans eat sheep – we often call it lamb but you may have heard it being called mutton as well. Which part of the sheep do we eat? Sheep only eat plants like grass. They do not eat meat. Some humans also choose not to eat meat. 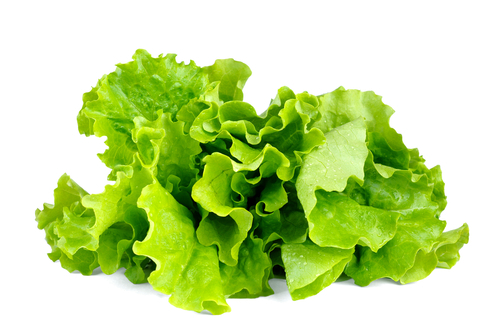 People who only eat plants – and not meat – are known as _________________. Sometimes we can get more than one type of food product from an animal. Apart from meat, what other food products can we get from cows? Match the animal to its most common food source. The fox is an omnivore. This means it has more than one food source and will eat both plants and animals. 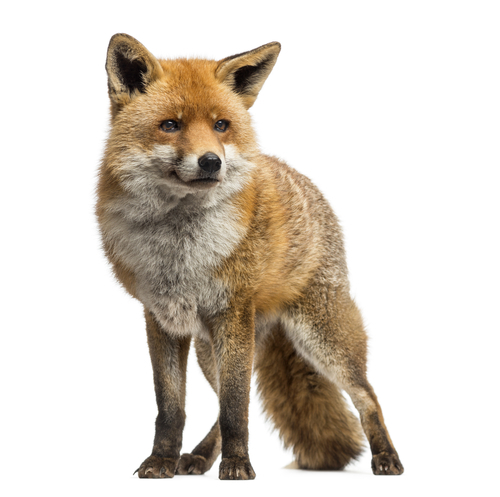 Sometimes foxes will eat small birds like blackbirds. 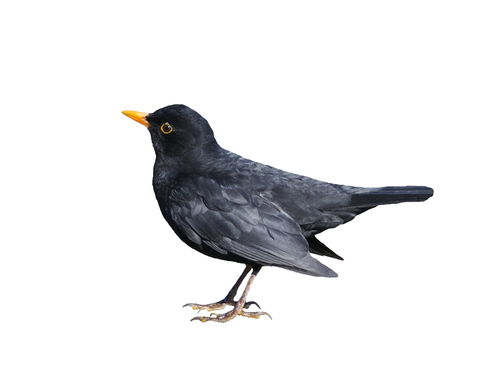 Blackbirds also eat a wide range of food sources. Look at the food chains below. Which food chains are correct? Look at this food chain. Which animal is missing from the food chain? We eat the meat from sheep and other similar animals such as cows and pigs. The meat from an animal such as a sheep is actually its muscle. The other parts of the sheep such as its horns and its wool are not suitable for humans to eat. Many people choose to be vegetarians. Some people believe it is wrong to kill animals for our food, others simply do not like the taste of meat. A carnivore is an animal that only eats meat. 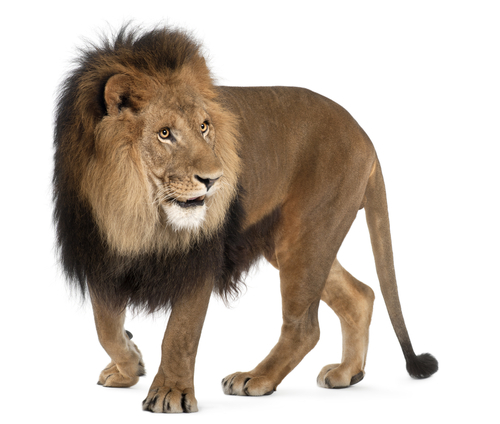 A lion is a good example of a carnivore. A herbivore is animal that only eats plants. 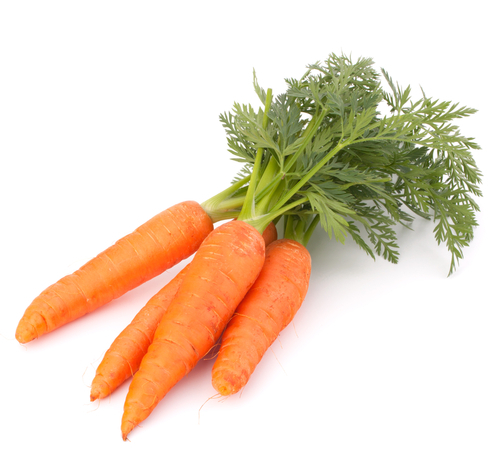 An omnivore is an animal that eats both meat and plants. Humans are good examples of omnivores who can choose to be vegetarians. Most of the milk that we pour on our cornflakes and add to our cup of tea comes from cows. We can buy it from the supermarket or the local shop in big bottles. Other animals such as goats and sheep also produce milk. We can even get milk from plants like the coconut and soya. 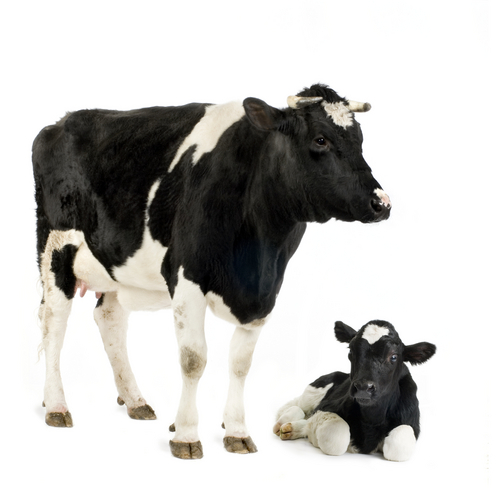 Milk is fantastically useful; we can use it to make cheese, chocolate, cream, yogurts, and of course milkshakes! Many of these foods are often called dairy products. All of these animals can be found in a woodland environment. The majority of the animals in this list do not eat each other, however there is one exception. That's right, the badger will eat the caterpillar! Can you draw up a food chain which links badgers, caterpillars and leaves? Blackbirds do not eat field mice. The field mouse is much too big for a blackbird. Remember, in a food chain the arrow should always point in the direction of the organism that is feeding. The answer is of course a human. We eat tonnes of chicken. Cows are herbivores and do not eat chickens despite being much bigger than them. Penguins live at the South Pole and eat fish. Chickens eat many things and have been known to eat earthworms, so it's safe to say that an earthworm definitely will not eat a chicken.